The 18-year-old Ousmane Dembele has taken Ligue 1 by storm this season, putting in some terrific performances to seal his place in the team. Dembele has had a great start to his career. He’s scored 9 goals in just 13 starts this term, including an excellent hattrick this past weekend to ensure a 4-1 win for his side. The feat got him into our Team of the Week, and to the attention of a lot of scouts. His pace and dribbling ability (4.41 successful dribbles per game) have seen him succeed pretty much all over the attacking midfield. Exciting times lie ahead for the youngster for Rennes. The tricky left sided midfielder has been a regular for Mainz this season, and has even started breaking into our Talent Radar Team of the Week with some of his performances lately. While he has been a regular starter, he’s seriously made his presence felt lately, especially in February, when he’s put in some game changing performances. The goals and assists have flowed for the Mainz player, including one in the win against Bayern Munich. Keep this up, and he’ll only rise. The young central midfielder has been a constant of the Gladbach team in their post Favre revival. The energetic all action Dahoud has made 19 starts this season, and been crucial in the middle of the park for a team that often lines up with just 2 in central midfield. 3 goals and 5 assists are not a bad haul, but hardly fair on an individual whose contributions would be difficult to measure. Along with Xhaka, he’s been linked with moves abroad, and the rumours are not coming from nowhere. The last edition of the rankings saw Coman place pretty high up at number 3, but the fall has been sharp for the youngster. The return to fitness of players like Robben and Ribery has Coman being relegated to a mostly watching brief, as he was during the weekend’s thrilling draw against Dortmund. Coman simply hasn’t been able to match his peers like Costa and Robben, but there is a definite silver lining. Coman has definitely proven to be a more than capable player at this level, and has a very bright future ahead of him. He’s also gotten to learn a lot in his year under the tutelage of Guardiola, and that will only leave him a smarter, and better player. Another player who wasn’t on the list the last time around, Calhanoglu has made it here on the basis of some consistent performances of late, especially in European competition. Having followed the player for a couple of seasons now, it’s safe to say that we at OOTB have a soft for him. He’s obviously a very dangerous attacking player, but he’s quite spectacular and entertaining too. 3 goals for the season is a bit of a disappointment when you consider that he takes about 3 shots a game on average, but not altogether surprising because most of the time he’s having a pop from way out. Barkley has always been recognized as one of the top talents in English football, and this season, he’s finally begun performing with some consistency. Sadly, a drop in the levels of that very trait in the last few months have seen him drop a spot in the rankings. While he started the season in a very aggressive attacking manner, of late, Barkley hasn’t been able to utilize his attacking license well enough, and Everton now find themselves in 12th place, a poor position for a team with the sort of talent that they have. Barkley should be on the plane to France in the summer, but the performances of players like Alli will surely make his place in the team well fought for. 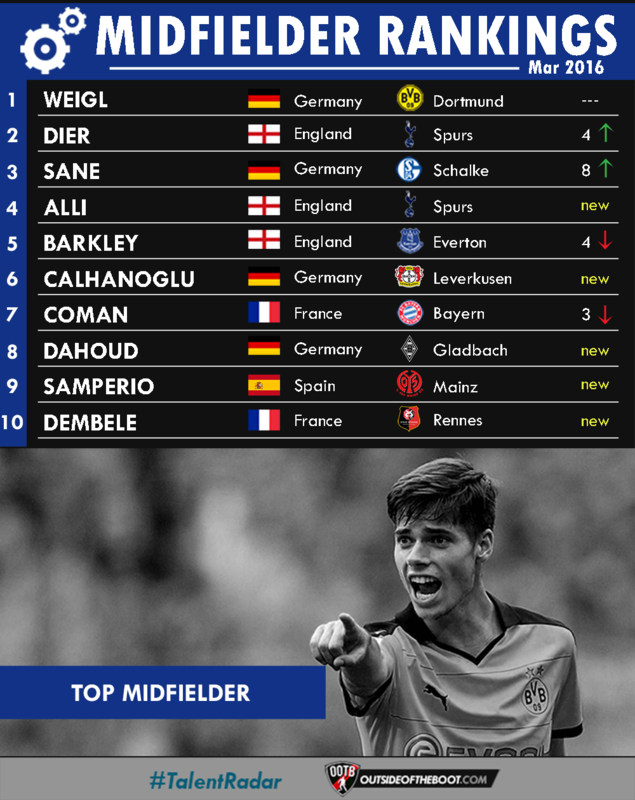 Alli is a new entrant, not only to this list, but also to the Premier league this season, and just like this list, he ranks pretty high up in the list of best players of the season too. The young midfielder, who only made his top flight debut this year has shone as an all round midfielder. His contribution to Spurs’ title charge has been phenomenal. All this is without mentioning some great efforts on goal, including, surely, the goal of the season. Alli is set for a place in the England Euro squad for the summer based on one of the most popular bookmakers, but before that, he has to see Tottenham through to the end of an exciting title race. The young Schalke product, Sane has come through in leaps and bounds this season. The attacking midfielder, one of the many Germans who play in this position, has got 5 goals and 4 assists in just 15 starts, which is a great track record. 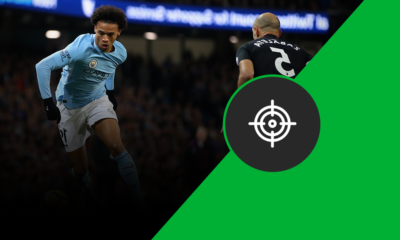 Sane is a thrilling player to watch too, with his speed, incisive passing, and dribbling making him a fan favourite. He’s moved up quite a few notches in the rankings based on his strong finish to 2015, and strong start to this year. Sane has been strongly linked to Liverpool, for a union with Jurgen Klopp and current teammate Matip. It will be a huge coup for Liverpool if they can, indeed, bring this one in. Dier has been nothing short of a revelation this season. Along with Delle Alli, he surely has to be in the running for the POTY award, and his transformation has been nothing short of phenomenal. With Spurs previously struggling in deeper midfield positions thanks to the non performance of Capoue, the performances of Moussa Dembele (or more likely his less talented twin), and the limits of Ryan Mason, Dier was given the job at the start of the season, being moved up from defence. The former Sporting man has worked miracles, with solid performances. His reading of the game has been crucial, and along with Alderweireld, he’s directed Spurs’ defensive efforts and pressing flawlessly.